Thank You dear heavenly Father for sending the only begotten and eternal Son of Your love – the Lord Jesus Christ to be born as a tiny baby in such humble conditions, so that the fallen race of mankind could be redeemed from their sin and be made sons and daughters of the Most High God – through faith in His name. How we bless Your holy name for all the goodness and loving kindness that You have extended to us and to all the fallen race of humanity. Thank You that He set aside His glory to be dressed in human flesh so that in the fullness of time, those that trust in His name might be made Your sons and daughters and joint-heirs with Christ Himself. Thank You that You never gave up on mankind but have allowed us to regain fellowship with Yourself, simply by grace through faith in Jesus Christ our Lord. 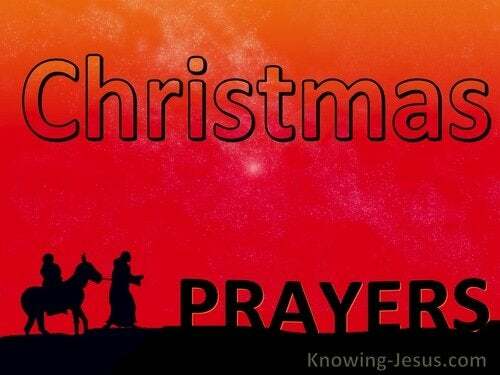 Give us we pray the light of Your love in our hearts this Christmas time and the opportunity to tell of the good news of the gospel of Christ to those that are perishing. Draw many into Your kingdom we pray so that Your name may be glorified and to You be all the praise and honour and glory and thanks - for You alone are worthy..
Lord Jesus, we lift up our voices of prayer and praise today as we think especially of Your birth on that first Christmas morning. Lord many people today will be celebrating Christmas Day with little or no understanding that in coming to earth in the form of a man, You came to die so that all who believe on Your name might be saved from their sins and have life - and have it more abundantly. Loving Lord and heavenly Father how we rejoice as we remember the wonder and joy of the birth of Christ into our fallen world on that first Christmas night, when the Prince of Peace Himself came to tabernacle among men - as was promised to our forefathers so many years before. Thank You for the gift of Your Son. Thank You for the glorious gospel of peace that is shed abroad in our hearts when we trust in His name. Thank You for the Person of Jesus Christ, Who laid aside His heavenly glory and was born to die so that we might be born-again and live. Father the glorious truth of the gospel of Christ is life and light to the children of men… it is peace and hope… it is love and joy … it is forgiveness and salvation… but too often the Christmas story has lost its impact on a world that has rejected Your truth and adopted the trappings of a world system, that is doomed to fail. Forgive us Lord – forgive us for the rebellious nature that is so often displayed at this time of the year and look down with compassion and mercy on us all this Christmas time.